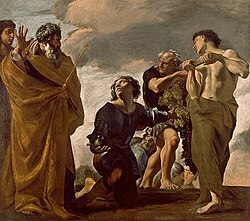 Joshua or Jehoshua (Ebreu: יְהוֹשֻׁעַ‬ Yĕhôshúa or Ebreu: יֵשׁוּעַ‬ Yĕshúa; Aramaic: ܝܫܘܥ‎ Isho; Greek: Ἰησοῦς, Arabic: يوشع بن نون‎ Yūshaʿ ibn Nūn, Turkis: Yuşa), is a figur in the Torah, bein ane o the spies for Israel (Num 13–14) an in few passages as Moses' assistant. ↑ Great Synaxaristes: (in Greek) Ὁ Ἅγιος Ἰησοῦς ὁ Δίκαιος. 1 Σεπτεμβρίου. ΜΕΓΑΣ ΣΥΝΑΞΑΡΙΣΤΗΣ. This page wis last eeditit on 10 Mey 2017, at 19:39.